Within the Debian community there has been a significant amount of concern about the GNU Free Documentation License (GFDL), and whether it is, in fact, a free license. This document attempts to explain why Debian's answer is no . It should be noted that this does not imply any hostility towards the Free Software Foundation, and does not mean that GFDL documentation should not be considered free enough by others, and Debian itself will continue distributing GFDL documentation in its non-free section. (1) What is the GFDL? This License is a kind of copyleft , which means that derivative works of the document must themselves be free in the same sense. It complements the GNU General Public License, which is a copyleft license designed for free software. (2) How does it fail to meet Debian's standards for Free Software? The GFDL conflicts with traditional requirements for free software in a variety of ways, some of which are expanded upon below. As a copyleft license, one of the consequences of this is that it is not possible to include content from a document directly into free software under the GFDL. Invariant sections create particular problems in reusing small portions of the work (since any invariant section must be included also, however large), and in making sure the documentation remains accurate and relevant. The second conflict is related to the GFDL's requirements for transparent copies of documentation (that is, a copy of the documentation in a form suitable for editing). In particular, Section 3 of the GFDL requires that a transparent copy of the documentation be included with every opaque copy distributed, or that a transparent copy is made available for a year after the opaque copies are no longer being distributed. 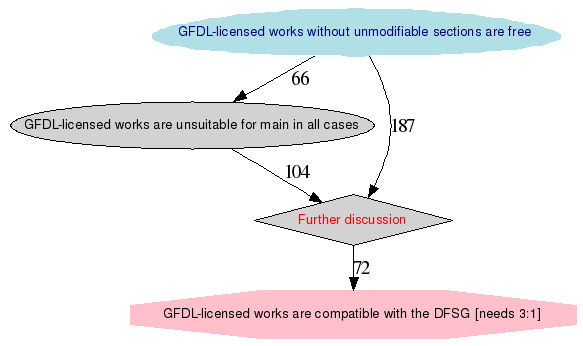 For free software works, Debian expects that simply providing the source (or transparent copy) alongside derivative works will be sufficient, but this does not satisfy either clause of the GFDL's requirements. The third conflict with the GFDL arises from the measures in Section 2 that attempt to overcome Digital Rights Management (DRM) technologies. In particular, the GFDL states that You may not use technical measures to obstruct or control the reading or further copying of the copies you make or distribute. This inhibits freedom in three ways: it limits use of the documentation as well as distribution, by covering all copies made, as well as copies distributed; it rules out distributing copies on DRM-protected media, even if done in such a way as to give users full access to a transparent copy of the work; and, as written, it also potentially disallows encrypting the documentation, or even storing it on a filesystem that supports permissions. (3) Why does documentation need to be Free Software? There are a number of obvious differences between programs and documentation that often inspire people to ask why not simply have different standards for the two? For example, books are often written by individuals, while programs are written by teams, so proper credit for a book might be more important than proper credit for a program. On the other hand, free software is often written by a single person, and free software documentation is often written by a larger group of contributors. And the line between what is documentation and what is a program is not always so clear either, as content from one is often needed in the other (to provide online help, to provide screenshots or interactive tutorials, to provide a more detailed explanation by quoting some of the source code). Similarly, while not all programs demonstrate creativity or could be considered works of art , some can, and trying to determine which is the case for all the software in Debian would be a distraction from our goals. In practice, then, documentation simply isn't different enough to warrant different standards: we still wish to provide source code in the same manner as for programs, we still wish to be able to modify and reuse documentation in other documentation and programs as conveniently as possible, and we wish to be able to provide our users with exactly the documentation they want, without extraneous materials. (4) How can this be fixed? What, then, can documentation authors and others do about this? An easy first step is to not include the optional invariant sections in your documentation, since they are not required by the license, but are simply an option open to authors. Unfortunately this alone is not enough, as other clauses of the GFDL render all GFDL documentation non-free. As a consequence, other licenses should be investigated; generally it is probably simplest to choose either the GNU General Public License (for a copyleft license) or the BSD or MIT licenses (for a non-copyleft license). As most GFDL documentation is made available under the terms of the GNU Free Documentation License, Version 1.2 or any later version published by the Free Software Foundation, the Free Software Foundation is able to remedy these problems by changing the license. The problems discussed above require relatively minor changes to the GFDL — allowing invariant sections to be removed, allowing transparent copies to be made available concurrently, and moderating the restrictions on technical measures. Unfortunately, while members of the Debian Project have been in contact with the FSF about these concerns for the past four years, these negotiations have not come to any conclusion to date. We consider that the GNU Free Documentation License version 1.2 conflicts with traditional requirements for free software, since it allows for non-removable, non-modifiable parts to be present in documents licensed under it. Such parts are commonly referred to as invariant sections , and are described in Section 4 of the GFDL. As modifiability is a fundamental requirement of the Debian Free Software Guidelines, this restriction is not acceptable for us, and we cannot accept in our distribution works that include such unmodifiable content. At the same time, we also consider that works licensed under the GNU Free Documentation License that include no invariant sections do fully meet the requirements of the Debian Free Software Guidelines. This means that works that don't include any Invariant Sections, Cover Texts, Acknowledgements, and Dedications (or that do, but permission to remove them is explicitly granted), are suitable for the main component of our distribution. Despite the above, GFDL'd documentation is still not free of trouble, even for works with no invariant sections: as an example, it is incompatible with the major free software licenses, which means that GFDL'd text can't be incorporated into free programs. For this reason, we encourage documentation authors to license their works (or dual-license, together with the GFDL) under the same terms as the software they refer to, or any of the traditional free software licenses like the GPL or the BSD license. We consider that works licensed under GNU Free Documentation License version 1.2 do fully comply both with the requirements and the spirit of Debian Free Software Guidelines. Within Debian community there has been a significant amount of uncertainty about the GNU Free Documentation License (GFDL), and whether it is, in fact, a free license. This document attempts to explain why Debian's answer is yes . 1: What is the GFDL? One of the most widespread objections against GFDL is that GFDL permits works covered under it to include certain sections, designated as invariant. The text inside such sections can not be changed or removed from the work in future. A Secondary Section is a named appendix or a front-matter section of the Document that deals exclusively with the relationship of the publishers or authors of the Document to the Document's overall subject (or to related matters) and contains nothing that could fall directly within that overall subject. [...] The relationship could be a matter of historical connection with the subject or with related matters, or of legal, commercial, philosophical, ethical or political position regarding them. The whole point of those works is that they tell you what somebody thinks or what somebody saw or what somebody believes. To modify them is to misrepresent the authors; so modifying these works is not a socially useful activity. And so verbatim copying is the only thing that people really need to be allowed to do. If the modified program normally reads commands interactively when run, you must cause it, when started running for such interactive use in the most ordinary way, to print or display an announcement including an appropriate copyright notice and a notice that there is no warranty (or else, saying that you provide a warranty) and that users may redistribute the program under these conditions, and telling the user how to view a copy of this License. We will be guided by the needs of our users and the free software community. We will place their interests first in our priorities. Currently GFDL is a license acknowledged as free by the great mass of the members of the free software community and as a result it is used for the documentation of great part of the currently available free programs. If Debian decided that GFDL is not free, this would mean that Debian attempted to impose on the free software community alternative meaning of free software , effectively violating its Social Contract with the free software community. We should be able to improve the free software and to adapt it to certain needs and this stays behind the requirement of DFSG for modifiability. GFDL allows everybody who disagrees with a personal position expressed in an invariant section to add their own secondary section and to describe their objections or additions. This is a reasonable method to improve the available secondary sections, a method that does not lead to misrepresenting the authors opinion or to censorship. Another objections against GFDL is that according to GFDL it is not enough to just put a transparent copy of a document alongside with the opaque version when you are distributing it (which is all that you need to do for sources under the GPL, for example). Instead, the GFDL insists that you must somehow include a machine-readable Transparent copy (i.e., not allow the opaque form to be downloaded without the transparent form) or keep the transparent form available for download at a publicly accessible location for one year after the last distribution of the opaque form. You must either include a machine-readable Transparent copy ALONG with each Opaque copy, or state IN OR WITH each Opaque copy a computer-network location from which the general network-using public has access to download using public-standard network protocols a complete Transparent copy of the Document, free of added material. Consequently the license requires distribution of the transparent form ALONG with each opaque copy but not IN OR WITH each opaque copy. It is a fact confirmed by Richard Stallman, author of GFDL, and testified by the common practice, that as long as you make the source and binaries available so that the users can see what's available and take what they want, you have done what is required of you. It is up to the user whether to download the transparent form. If the transparent copy is not distributed along with the opaque copy then one must take reasonably prudent steps to ensure that the Transparent copy will remain accessible from Internet at a stated location until at least one year. In these circumstances the requirement of GPL appears to be even more severe — a written offer, valid for at least three years, to give any third party a complete machine-readable copy of the corresponding source code. The third objection against GFDL arises from the measures in Section 2 that attempt to overcome Digital Rights Management (DRM) technologies. According to some interpretations of the license, it rules out distributing copies on DRM-protected media, even if done in such a way as to give users full access to a transparent copy of the work; and, as written, it also potentially disallows encrypting the documentation, or even storing it on a file system that supports permissions. This clause disallows the distribution or storage of copies on DRM-protected media only if a result of that action will be that the reading or further copying of the copies is obstructed or controlled. It is not supposed to refer the use of encryption or file access control on your own copy. If a patent license would not permit royalty-free redistribution of the Program by all those who receive copies directly or indirectly through you, then the only way you could satisfy both it and this License would be to refrain entirely from distribution of the Program. We do not think that this requirement of GPL makes GPL covered programs non-free even though it can potentially make a GPL-covered program undistributable. Its purpose is against misuse of patents. Similarly, we do not think that GFDL covered documentation is non-free because of the measures taken in the license against misuse of DRM-protected media. For this GR, as always statistics are being gathered about ballots received and acknowledgements sent periodically during the voting period. Additionally, the list of voters is available. Also, the tally sheet may also be viewed (Note that while the vote is in progress it is a dummy tally sheet). Since amendment B would require modification of a foundation document, namely, the Social Contract, it requires a 3:1 majority to pass. DFSG article 3 would need to be changed, or at least clarified. As it reads, it states that licenses a work is available under must allow modifications of the work. In the graph above, any pink colored nodes imply that the option did not pass majority, the Blue is the winner. The Octagon is used for the options that did not beat the default. In the following table, tally[row x][col y] represents the votes that option x received over option y. A more detailed explanation of the beat matrix may help in understanding the table. For understanding the Condorcet method, the Wikipedia entry is fairly informative. received 145 votes over GFDL-licensed works without unmodifiable sections are free. Option 2 defeats Option 1 by ( 211 - 145) = 66 votes. Option 1 defeats Option 4 by ( 223 - 119) = 104 votes. Option 2 defeats Option 4 by ( 272 - 85) = 187 votes. Consider all possible two-way races between candidates. The Condorcet winner, if there is one, is the one candidate who can beat each other candidate in a two-way race with that candidate. The problem is that in complex elections, there may well be a circular relations ship in which A beats B, B beats C, and C beats A. Most of the variations on Condorcet use various means of resolving the tie. See Cloneproof Schwartz Sequential Dropping for details. Debian's variation is spelled out in the the constitution, specifically, A.6.